The “don’t look at me” hoodie is an important part of celebrity culture, but recently, while discussing the costume design of The Handmaid’s Tale, Jezebel history expert Kelly Faircloth posed an interesting question: why hasn’t the bonnet made a comeback? 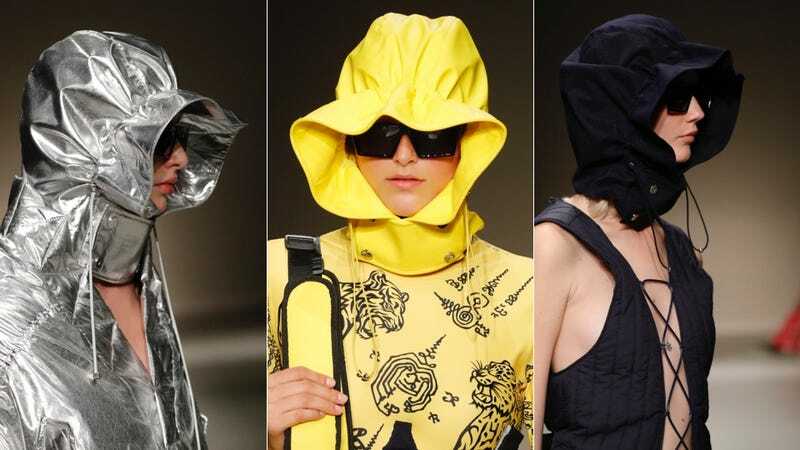 Since Reconstruction, then, you can surmise that outside of certain sects of Mennonites and Amish, the closest thing U.S. fashion has had to the bonnet functionally and structurally (in that it hides your eyes and protects you from the sun) is the bucket hat, which comes in varying degrees of cool, depending on the year and who’s wearing it. Protecting oneself from the psychic damage of the outside world was not far off, as it happens; Chen was inspired by Noah’s Ark, with garments that both reflect the tale (she sent pieces down two-by-two, and referenced animals in the prints) and acknowledge the need for practical wear to weather it. I refer back to my colleague Kelly, who had a fashion prediction that may be in line with Chen’s thinking: “Honestly,” Kelly wrote me in Slack, “I would not be surprised if the American prairie style bonnet comes back in our global warming hellscape.” Looks like we have ourselves a trendsetter!